<?/fontfamily>The idea behind Hint is simple: pure water, nature's original refreshment, accented with a hint of natural flavor. There's no sugar and no artificial sweeteners. 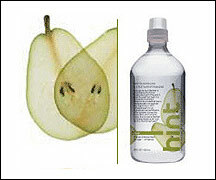 Hint Water comes in a whole slew of interesting and delicious flavors (other than Pear), like Cranberry-Orange, Cucumber, Lime, Pomegranate-Tangerine and more. We LOOOOOVE this stuff. It tastes like crisp, fresh water, with a slight hint of flavor. It's extremely refreshing, not sweet at all, and the flavor is so subtle that it doesn't take over. Best served ice cold, we highly recommend Hint Water and think it's, without a doubt, the BEST flavored water out there. There is a catch, though. Hint Water isn't available in many stores, but it can be ordered online. Believe us, it's worth the extra effort. HINT WATER ROCKS!!!! Important things to note: This water tastes a lot like actual water, and not some fake, flavored, sweetened beverage. And have we mentioned that it rocks? Dasani Flavored water isn't bad. In fact, of all the store-bought sweetened, flavored waters we tried, we like it the best. Now that may sound better than it actually is, though, because we pretty much hated most of the ones we tried. Sweetened with Splenda, this stuff is not only available in Lemon, it comes in Strawberry and Raspberry, too. The lemon flavor actually tastes a bit like weak lemonade, and is fairly refreshing when served cold. Available at most supermarkets. <?/fontfamily>Important things to note: <?fontfamily><?param Arial>This water contains Splenda, and has a nice, fruity kick. It tastes a bit more like watered down fruit juice than flavored water, but it's still pretty good.</TD> <TD width=7 bgcolor="#FFFFFF"></TD><TD vAlign=top align=right bgcolor="#FFFFFF" width="100"><table align="right" cellpadding="0" cellspacing="0" border="0"><tr><td align="left"><IMG src="http://www.hungry-girl.com/sectionimg/1602dasani-lemon.jpg" vspace=5 alt=""></td></tr></table></TD> <TD width=25 bgcolor="#FFFFFF"></TD> </TR><TR> <TD bgcolor="#FFFFFF" width=29></TD> <TD bgcolor="#FFFFFF" height=25></TD> <TD bgcolor="#FFFFFF" width="5" height=20></TD> <TD bgcolor="#FFFFFF" width="343" height=20></TD> <TD bgcolor="#FFFFFF" width="5" height=5></TD> <TD bgcolor="#FFFFFF" height=20><p> </p> </TD> <TD bgcolor="#FFFFFF" width=25></TD> </TR></TABLE></TD></TR><TR> <TD colSpan=7 height=15> <TABLE cellSpacing=2 cellPadding=2 border=0><TR> <TD colSpan=7 height=15></TD></TR><TR> <TD width=29></TD> <TD vAlign=top align=right><table align="right" cellpadding="0" cellspacing="0" border="0" width=100><tr><td align="right"><IMG src="http://www.hungry-girl.com/sectionimg/1603watersensations.jpg" vspace=5 alt=""></td><TD width=10></TD></tr></table></TD> <TD width=5></TD> <TD valign=top style=" COLOR: #000000; FONT-SIZE: 13px; FONT-FAMILY: Palatino Linotype, Georgia, Times New Roman; LINE-HEIGHT: 16px;" colSpan=3><SPAN style=" FONT-WEIGHT: bold; COLOR: #000000; FONT-SIZE: 14px; LINE-HEIGHT: 18px; FONT-FAMILY: Palatino Linotype, Georgia, Times New Roman;">Water Sensations</SPAN><br><br><STRONG><EM>(1 packet - 0 calories, 0g fat, 0mg sodium, 0g carbs, 0g sugar, 0g protein)<BR><BR><?/fontfamily></EM></STRONG>Water Sensations is a clear liquid flavor enhancer for water. It contains only natural flavors and is sweetened with Sucralose (Splenda). What we found interesting about this stuff is that it comes in adorable water bottle shaped packets that can easily fit in your purse, pocket or desk. Some of the flavors are better than others. In fact, we really only enjoyed two of 'em -- the Mixed Berry, and Grape. If you're gonna go for this stuff, we say stick with those two flavors. You can buy Water Sensations at Target, or <A href="http://www.watersensations.com/" target=_blank>online</A>.<BR><?fontfamily><?param Arial><STRONG> <BR><?/fontfamily>Important things to note:</STRONG> Water packets are cute and convenient. We've never seen anything like this before, because the concentrate you add to your water is in liquid form, which is kinda cool! ******Jana SkinnyWater***** WORST WATER EVER! It's hard to believe that anyone would be able to drink more than one sip of this frightening liquid. Imagine sucking on a "wet nap" and you'll know exactly how scary and horrible this "beverage" tastes. It's supposed to reduce your appetite and we're sure it does, because after sipping it, you may not feel like eating for five hours. Flavor Splash Aquafina, Citrus Blend - Who cares if it's calorie free? This stuff tastes awful -- like bad, chewable baby aspirin. Yuck! Fruit2O, Natural Raspberry - OK, we know this stuff won some kind of an award, but it doesn't taste good at all. It was actually very sour and overly sweet at the same time (if you can believe that). Sorry, Fruit2O. We really wanted to like you but didn't. Note: We only sampled the Natural Raspberry flavor. Perhaps others are better? Nestle Pure Life, Strawberry Splash - Ewwwww... GROSS! This "water" is sour and tastes like melted strawberry air freshener. Ever hear of True Lemon or True Lime? They're all natural flavorings that are great little enhancers for water or iced tea. Want free samples? Click here. Woohoo! Manana is Cinco De Mayo! Celebrate with Amy's Tamale Pie, or Cedarlane enchiladas. Ole! Share this helpful H20 news with humans who drink liquids. Click "send to a friend" NOW!